Today we are living in a world where technologically speaking; everything has from analog to digital, and photography sector hasn’t been left behind. In simple terms, we belong to a generation of social media, whereby when something new happens, we immediately post on it on Instagram, Facebook, Twitter, Snapchat, and other social media platforms, to notify our friends. Ideally, we really love expressing ourselves through pictures. Moreover, we all relish editing our photos making them look more charming. And this is where photo editing programs like the Wondershare Fotophire Photo Editing Software comes in handy. 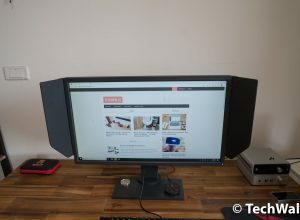 The Wondershare Fotophire is an amateur or a professional all-in-one full photo editing toolkit for you. This software allows you to turn your pictures more professional as well as visually appealing. With this photo editing toolkit, you can edit your photos to any effect you want – right from adding texting, creating transparent backgrounds, adding colors and beautifying images, and also adding creative filters. Sometimes we tend to take photos in improper, but the Wondershare Fotophire allows you to do some tweaking and make your photo even more lovely. In this article, I will be discussing more of the Wondershare Fotophire Photo Editing Software more comprehensively. Whether you are a digital photographer, social media manager, online shop owner, blogger, webmaster, or photo enthusiast, then the Wondershare Fotophire is a perfect toolkit to edit your photos. 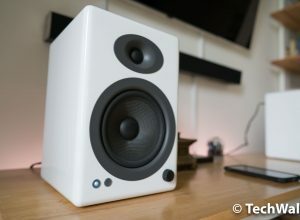 Let’s find out more about the Wondershare Fotophire! This photo editing software offers you a complete package of fantastic features, ideal for making your pictures have a much more premium and proficient look. 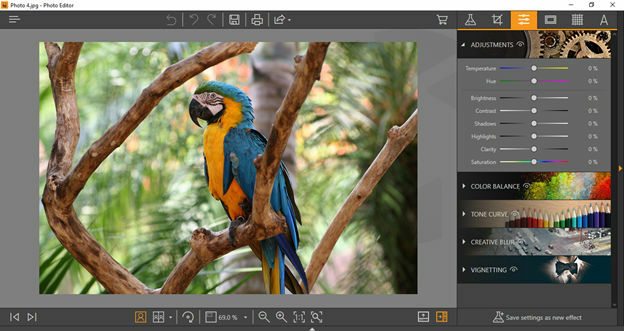 Currently, the Wondershare Fotophire photo editor toolkit comprises of 3 modules, and they include Photo Editor, Photo Cutter, and Photo Eraser. The photo editor is a very significant tool when it comes editing your images. The photo editor allows you to add effects, enhance the texture display, add texts, and do a lot of photo tweaking necessary. This editor module provides you a smooth and swift editing experience. In photo editor, there are more than 200 effects available for you to select from. 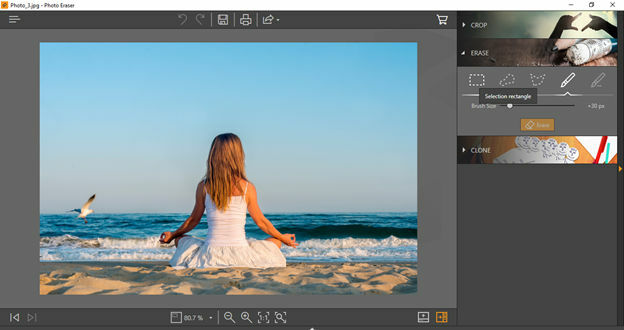 Therefore, if you’re finding something extra to enhance the aspect of your pictures, this photo editor provides you that additional factor to perfect your photos in just a matter of minutes. That’s not all, with its drag and drop function, you can swiftly edit and cut your photos. It also supports JPEG, PNG, TIFF (8-bit, 16-bit), BMP, JRX, AND JIFF. In comparison to other photo editing apps, this photo editor supports more formats. This photo editor also enables you to select 100’s of frames with a variety of styles. There are also over 20 blend modes available, which offers you full control over the intensity of the overlay effects. You can lighten or darken the tones in your pictures along the curve line as you desire. And with the auto-straightener, you can easily straighten your images precisely with no time. Another impressive feature of this module is that it allows you feel extremely comfortable with its user-friendly interface, which will enable you to apply these mentioned things in a just a few clicks. 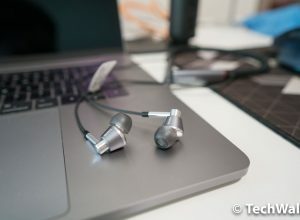 The photo cutter is another impressive feature I really like about the Wondershare Fotophire. For instance, let’s say you took a picture and didn’t love its background, this feature allows you to change the background to something else, let’s say into a white background. This photo editing toolkit makes it everything incredibly easy, from replacing backgrounds to removing backgrounds, and from extracting a specific part of the picture to creating fancy designs that you prefer. Honestly, the Wondershare Fotophire photo cutter is a must-have feature if you want to create unique-featured images for your blog post or website. You can efficiently acquire this by moving the transparent background images created with the photo cutter to your choice banner design. The Image cutter also features advanced color-detection technology perfect for deducing the object edges. Therefore, you don’t have to edit pixel by pixel. At some point, we usually take beautiful photos only to realize later that there are some unwanted objects which are ruining the photo. Worry no more. With the help of the Wondershare Fotophire photo eraser, you can now quickly remove the unwanted objects or person in your photo without affecting the background in just a matter of seconds. For instance, there are some cameras which when you take a picture, a watermark or date stamp always display at the bottom of the photo, which tends to ruin the background of your image – but with the photo eraser, you don’t have to worry about that anymore. The photo editor feature is an excellent deal for blogger and digital photographers. 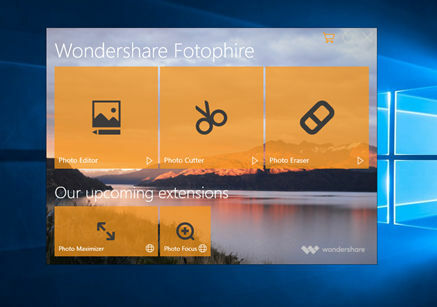 The Wondershare Fotophire Photo Editing Toolkit is currently available for the Windows Operating System PCs Only. But I have heard there will be a Mac Version soon. The impressive thing about this software is that there is a TRY FREE Version as well as a Premium Version. The TRY FREE Version comes with all the features as well as the functions – hence allowing you to be familiar with the software and also decide whether it meets your requirements. But there will be watermarks after you exporting the images. 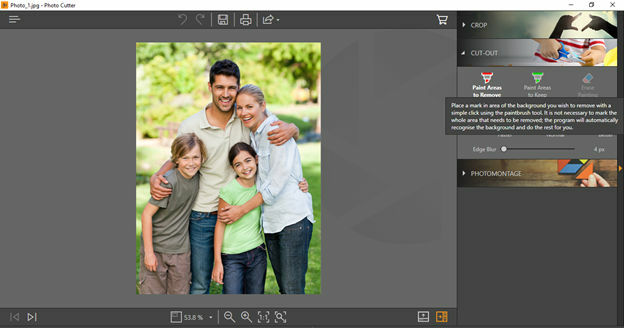 The Premium Version of Wondershare Fotophire retails at $49.99 instead of its original price of $89.99 (on February). 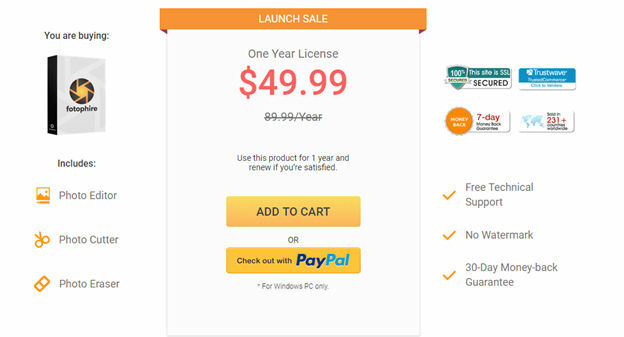 The price tag offers you a limited One Year License to use all of the Wondershare Fotophire features and functions without any restrictions for a whole year. You can use this product for one year and renew if you are satisfied. Moreover, there is a 30-day money back guarantee. So if you aren’t satisfied with the product, you get a full refund of the money. The Wondershare Fotophire Photo Editing Software is an excellent toolkit and does an impeccable job as described. With so many impressive features, such as erasing unwanted objects, adding various effects to your photo, and changing its appearance with diverse backgrounds, this photo editing toolkit is worth the value. It is ideal for both the beginners and professionals. 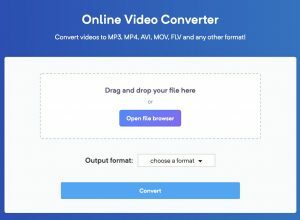 And with an incredibly easy-to-use interface, this toolkit lets you explore your creativity and offers you an astonishing photo editing experience.